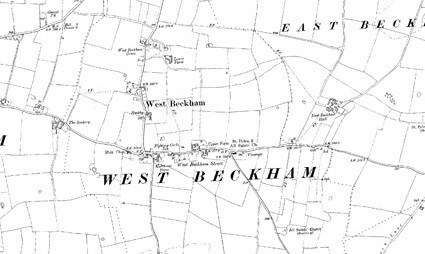 West Beckham is three miles south of Sheringham. It’s double sided village sign stands at the junction of Sheringham Road and The Street. The two scenes both depict the agricultural importance of the area. The village possesses no great mansions, has no famous sons and lacks a village green but despite this it epitomises the inland coastal villages in the area. The walls are built from blue flint gathered from the nearby beaches, with local red brick quoins and ashlars, topped off with the traditional Norfolk pantiles. It is a scattered community with approximately 220 inhabitants. Its name is derived from the Danish ‘beck’ meaning brook or stream. It has the singularity of two rivers within 100 yards of each other in the same field; one flowing out to sea on the North coast at Cley-next-the-Sea whilst the other is the Beck, flowing into Scarrowbeck and then the Bure, and out to sea at Great Yarmouth. Unlike much of North Norfolk the area reaches an altitude of 300ft above sea level making it one of the highest areas in the county. This elevation is a result of great glaciers thousands of years ago which pushed up the Cromer Ridge. This factor led to the erection of two radio masts in 1936, followed by others up to 400ft high. 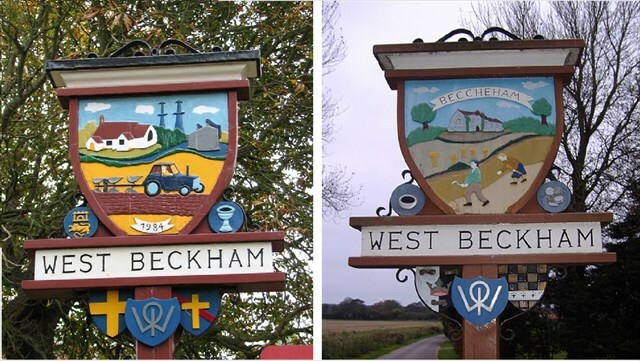 They were the first towers in the radar chain during WW2 and were referred to by Lord Haw Haw as “the beastly things at Beckham”. Just down the road from the village is the site of Erpingham Workhouse which closed in the early 1950s and was later demolished. In the winter inmates they had to be in the workhouse before the 6 o’clock bell and in the Summer by 8.00pm. Lodging was in exchange for work in the two acre garden, the laundry, hauling coals etc, and when they went on their way they were fortified by a lump of cheese and some bread. Whilst conversion work was carried out on the village pub a single child’s boot dating from the 17th century was found carefully secreted in the inglenook. Many years ago when all the farm work was done by men and animals, sons were of vital importance in the farmers household, and it was thought that if a boy’s single boot were hidden in the house that boy wouldn’t leave home. The cache is located in close proximity to the village sign. Parking is available but please don’t block the junction. You do not need to climb on the sign to retrieve it. There is only room for a log so please bring your own pen.